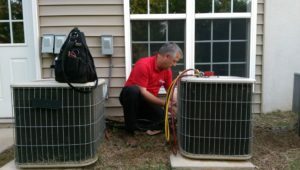 You love how cool and comfortable your AC unit makes your home, but you hate how the condenser looks in your yard. Condensers are a bit boxy and usually a “blah” shade of beige or grey. They were certainly made to be reliable, not fashionable. Your first instinct may be to cover your condenser with plants or a large decorative box. This can be a major mistake, as your unit needs room to vent and operate. Not giving it enough room to breathe can hurt its efficiency and even cause it to break down completely. If this has already happened to you, you may want to check this out to book a professional to come to look at your unit. Does this mean you’re stuck with this eyesore in your backyard or on the side of your home? If, you want to cover or hide your condenser, here is how you should decorate the area around it. Yes, you can use plants and shrubs in the area, but distance and maintenance are key. Keep plants at least 2-3 feet away from your condenser and make sure that you trim them regularly so they don’t encroach into the buffer space. Tall plants and trees that give your condenser a bit of shade and create a microclimate are actually a good thing. This means your unit isn’t dealing with the full brunt of the summer heat, which will improve its performance and extend its life. Just make sure that the unit has good airflow 5-6 feet above it as well. Using stylish trellis and lattice placement can help you hide your condenser, while still ensuring that it’s getting the proper airflow. The barrier can also actually help protect the unit from hard wind or hail storms. But, don’t completely box in your condenser. It needs to be accessible to you or an HVAC tech Make sure there is a gate or some sort of access point. There are countless design and color possibilities out there that could actually make this area your new favorite part of the backyard. 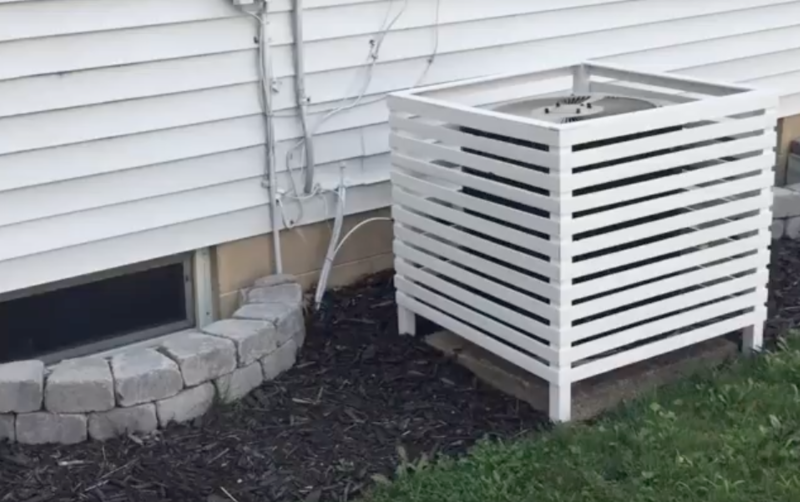 Moveable and mobile potted plants can give you an elegant way to cover your condenser and they can be strategically placed at a safe distance. They can also be moved back farther away from the unit as they grow out. They’re also removable, which gives you the option of planting something different every year. This solution also keeps your condenser accessible when maintenance time comes. As much as you wish your condenser was a nice shade of forest green, or a brown accent color to go with the rest of your backyard, you’re stuck with this color. Painting your condenser will actually affect its heat transfer, which will hurt its performance and efficiency. You may like its new look, but you won’t like that it has to work harder to cool your home, nor the increase in your utility bills. So, put the paint away and stick with one of the decorative fixes we listed above. All of these solutions are relatively cheap, and can actually help you extend the life of your HVAC system, instead of reducing its life by suffocating it.